The 2020 Chicago New Year’s Eve Party is at the Chicago Hilton. For all your New Year’s Eve packages for the NYE party in Chicago, IL, we have all the information that you need. Come to us to learn about the luxury and lavish experience that awaits you this New Year’s Eve. Our New Year’s Eve Party will include over 60 bartenders and servers to ensure short drink lines and bars open from 9 pm to 1 am for General Admission. Drink are included in the ticket price — unlimited cocktails are available while the bar is open. Don’t forget about our VIP New Year’s Eve tickets for this year’s party. Our VIP ticket packages include everything in our GA packages and a number of extra amenities including bars open from 8pm – 1:30am. All our New Year’s Eve ticket packages include three parties in three venues starting on Monday, December 30, 2019. 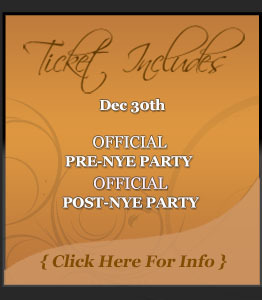 Contact us today to register for the premier New Year’s Eve party in Chicago, IL, by email at chicagonye@gmail.com. Enjoy a Pasta Buffet, Variety of Hors d’oeuvres, Desserts, & more ~ Bon Appetit! w/ Private Hosted Cocktail Reception from 9:30pm – 11pm. Win a VIP Reserved Booth For Your Group! Winner announced December 27th, 2019. Wristband for the most exclusive venue in Chicago included with your ticket. 3 Parties / 3 Venues / All Inclusive in 1 NYE Ticket. Note: Brands and menu items subject to change anytime before the event.